Oral cavity harbors complex, multispecies communities of microflora. In a homeostatic environment, these indigenous microflorae play a significant role in defending host from invasions by various exogenous pathogens; although when this homeostasis gets disturbed, it might result in dental caries. Caries is a biofilm-induced; saliva-mediated acidic demineralization of enamel and dentin of the teeth. Early childhood caries (ECC) may be a particular aggressive form of caries, initiating on the smooth surfaces, rapidly progressing and having an unfavorable long-lasting effect on the dentition. The development of dental caries involves a sucrose-induced ecological change in the bacterial composition toward cariogenic species. This cariogenic atmosphere generates favorable condition for certain conditional pathogens to compete with the commensal microflora more efficiently for the tooth surface resulting in dental caries. The oral microbial flora mainly involved in ECC is Streptococcus mutans. It is a Gram-positive, facultative anaerobic bacteria,, usually persists as a normal member of oral bacterial community, while in the presence of fermentable carbohydrates, these acid-producing organisms cause damage by dissolving tooth structure.,Streptococcus sanguinis, also a Gram-positive facultative anaerobic bacteria,, is a normal tooth colonizer, and its existence is related to healthy biofilms and absence of dental caries.S. sanguinis can inhibit S. mutans and compete for colonization on tooth surfaces. A positive and inverse correlation of S. mutans and S. sanguinis respectively is seen with decayed teeth in the mouth. As infants and young children with ECC are generally at increased risk for further caries development, preventive as well as therapeutic methods are often necessary for them. Hence, the present study was done to compare the pre- and post-treatment salivary levels of S. mutans and S. sanguinis in ECC. The present study was performed in subjects reporting to the Department of Pediatric and Preventive Dentistry, Maharishi Markandeshwar College of Dental Sciences and Research and in collaboration with the Department of Microbiology, Maharishi Markandeshwar Institute of Medical Sciences and Research. Approval for the study design, protocol, and methodology was obtained from the Institutional Research Committee and Ethics Committee, M.M.U with the project No. 488 dated on April 8, 2015. Informed written consent of parents and/or guardian was taken with a detailed case history, and preoperative clinical finding was recorded in patient assessment form. Protocol for ECC was followed according to the American Academy of Pediatric Dentistry guidelines. Procedures were performed by principal investigator. Subjects reported to the outpatient department in the department of pediatric and preventive dentistry fulfilling the inclusion criteria was selected to participate in the study. Children (both males and females) between 3 and 6 years of age with decayed teeth ≥2 and whose parents agreed to participate in the study were included in the study while children with special health-care needs/any systemic illness, taking antibiotics, or completed a course of antibiotic within the past 4 weeks and those with abscess due to dental caries were excluded from the study. Bacterial culturing and identification were performed in microbiology laboratory. Mutans-Sanguis agar medium (M977) recommended for the differentiation of S. mutans and S. sanguinis was used. The autoclaved media was then poured into sterile disposable Petri dish More Detailses (90 mm) and allowed to dry. The pretreatment saliva samples were inoculated by using 4 mm diameter loop on Mutans Sanguis agar medium for S. mutans and S. sanguinis growth. Culture plate was then incubated at 37°C for 24 h for S. mutans and S. sanguinis growth in an incubator. Following incubation, colonies were identified by the morphological characteristics of S. mutans and S. sanguinis on Mutans Sanguis agar medium. S. sanguinis colonies appeared smooth or rough, hard, and rubbery in consistency, either gray, white, or colorless which adhere strongly to the agar medium making them difficult to remove with a inoculating loop and can be differentiated from S. mutans colonies which are irregular, rough, white or yellow in color, resembling granular frosted glass and can be easily picked off or easily detachable from the agar medium [Figure 1]. Various confirmatory tests such as Gram-staining, catalase test, mannitol, sorbitol fermentation, and bile esculin tests were done. Colony counting was done and expressed in CFU/ml. After the above microbiological procedures, the dental treatment procedures (oral prophylaxis, restorations, endodontic treatment, and extractions) were carried out depending on their need base. Similar saliva sample collection method and microbiological procedures were applied after the dental treatment procedures. Both the bacterial colony counts (pre- and post-treatment) for S. mutans and S. sanguinis were then analyzed and compared [Figure 2]. The present study included 40 eligible participants (19 males and 21 females), age group of 3–6 years with the mean age of 4.83 years [Table 1] and [Table 2]. A significant weak positive correlation was found between decayed teeth and pretreatment S. mutans count with r = 0.366 and P = 0.028 and a nonsignificant weak positive correlation between decayed teeth and pretreatment S. sanguinis count was seen with r = 0.137 and P = 0.425 using Spearman's correlation [Table 3]. A statistically significant difference was observed in posttreatment mean S. mutans and S. sanguinis counts as compared with mean pretreatment counts (P < 0.001) using Wilcoxon signed-rank test [Table 4]. No significant gender association was found between pre- and post-treatment S. mutans and S. sanguinis counts with P = 0.908 and also between decayed teeth with P = 0.321 using Mann–Whitney U-test. ECC is a particularly aggressive form of dental caries affecting the primary teeth of young children. Although ECC has got multifactorial etiology, the role of diet and microorganisms is essential and well recognized. In healthy environmental state, various microbial species in biofilms maintains a natural balance and restricts potentially harmful bacteria from colonizing. This balance could be disrupted by few ecological features and interspecies interactions, which facilitate the dominant growth of definite species, leading to dental caries. S. mutans is the principal bacteria isolated from children with ECC and plays a crucial role in the commencement and progression of the disease., However, S. sanguinis has been associated with good oral health and caries-free environment. Similarly, Carlsson et al. in their study found that S. sanguinis compete with S. mutans for tooth colonization sites, since both microorganism need the existence of teeth for their colonization process. In the present study, a significant weak positive correlation was found between pretreatment S. mutans counts and decayed teeth; however, a nonsignificant weak positive correlation was found between pretreatment S. sanguinis and decayed teeth [Table 3], similar to the study done by Loesche et al. in which children with higher number of decayed teeth surfaces had significantly greater proportions of S. mutans than caries-free children. In the present study, full mouth dental treatment procedure was performed for ECC. This may cause ecological shift toward more beneficial oral microbial species such as S. sanguinis and hence maintaining a proper balance and homogeneous state among various microbial species in the oral environment. Apart from this, there is competition, and mutual antagonism exist between these two organisms by Mutacin IV and Hydrogen Peroxide (H2O2) production by S. mutans and S. sanguinis respectively as shown by Kreth et al. and these could be the most promising explanation for the significant elevation of S. sanguinis counts after the treatment in this study. Complete dental treatment procedures showed a significant reduction in the salivary levels of S. mutans and a significant elevation in salivary levels of S. sangunis. A positive association is observed between S. mutans and ECC while S. sanguinis is positively associated with posttreatment oral environment. Based on the results of the study, assessment of relative salivary levels of S. mutans and S. sanguinis is helpful in identifying children at high risk for ECC and also creating novel preventive and treatment protocol. Ecological balanced and homogeneous environment were re-established by performing complete dental treatment for ECC as a significant decrease in the bacterial counts of cariogenic species S. mutans and significant increase in the bacterial counts of beneficial species S. sanguinis were reported after the treatment. Other risk factors such as diet, frequency, and type of sugar consumption, oral hygiene measures, and fluoride exposure could have been a significant impact on the salivary bacterial counts have not been included in the present study and the mechanism by which oral microorganisms compete with each other requires further detail investigations. G.M. Sogi, Prof/HOD, Department of Community Dentistry, Maharishi Markandeshwar College of Dental Sciences and Research, for review in the article. Prof. Meera Sandhu, Department of Pediatric and Preventive Dentistry, Maharishi Markandeshwar College of Dental Sciences and Research, for suggestions. Kuramitsu HK, He X, Lux R, Anderson MH, Shi W. Interspecies interactions within oral microbial communities. Microbiol Mol Biol Rev 2007;71:653-70. Sbordone L, Bortolaia C. Oral microbial biofilms and plaque-related diseases: Microbial communities and their role in the shift from oral health to disease. Clin Oral Investig 2003;7:181-8. American Academy of Pediatric Dentistry. Definition of early childhood caries (ECC). Pediatr Dent 2009;31:13. American Academy of Pediatric Dentistry. Policy on early childhood caries (ECC): Unique challenges and treatment options. Pediatr Dent 2010/11;32:45-7. Marsh PD. Microbiology of dental plaque biofilms and their role in oral health and caries. Dent Clin North Am 2010;54:441-54. Anantnarayan R, Jayaram Paniker CK. Textbook of Microbiology. 8th ed. Hyderabad: Universities Press Pvt Ltd.; 2009. p. 204-7. Barrow GI. Manual for the Identification of Medical Bacteria. 3rd ed. New York, U.S.A: Cambridge University Press; 1993. p. 58-9. Marsh PD. Are dental diseases examples of ecological catastrophes? Microbiology 2003;149:279-94. Caufield PW, Griffen AL. Dental caries. An infectious and transmissible disease. Pediatr Clin North Am 2000;47:1001-19, 5. Ge Y, Caufield PW, Fisch GS, Li Y. Streptococcus mutans and Streptococcus sanguinis colonization correlated with caries experience in children. Caries Res 2008;42:444-8. Giacaman RA, Torres S, Gómez Y, Muñoz-Sandoval C, Kreth J. Correlation of Streptococcus mutans and Streptococcus sanguinis colonization and ex vivo hydrogen peroxide production in carious lesion-free and high caries adults. Arch Oral Biol 2015;60:154-9. Mitrakul K, Vongsawan K, Sriutai A, Thosathan W. Association between S mutans and S sanguinis in severe early childhood caries and caries-free children a quantitative real-time PCR analysis. J Clin Pediatr Dent 2016;40:281-9. American Academy of Pediatric Dentistry. Policy on early childhood caries (ECC): Unique challenges and treatment options. Oral health policies. Pediatr Dent 2014/15;36:53-5. Priyadarshini HR, Fernandes BH, Rohini M, Nagarathnamma T. Relationship between severe-early childhood caries, salivary Mutans streptococci, and Lactobacilli in preschool children of low socioeconomic status in Bengaluru city. J Indian Soc Pedod Prev Dent 2014;32:44-7. Kaur A, Kwatra KS, Kamboj P. Evaluation of non-microbial salivary caries activity parameters and salivary biochemical indicators in predicting dental caries. J Indian Soc Pedod Prev Dent 2012;30:212-7. Mutans-Sanguinis Agar Media M977. Technical Data. Mumbai: Himedia Laboratories Pvt. Ltd. Avaialble from: http://www.himedialabs.com. [Last accessed on 2018 Sep 25]. Palmer CA, Kent R Jr., Loo CY, Hughes CV, Stutius E, Pradhan N, et al. Diet and caries-associated bacteria in severe early childhood caries. J Dent Res 2010;89:1224-9. Kreth J, Zhang Y, Herzberg MC. 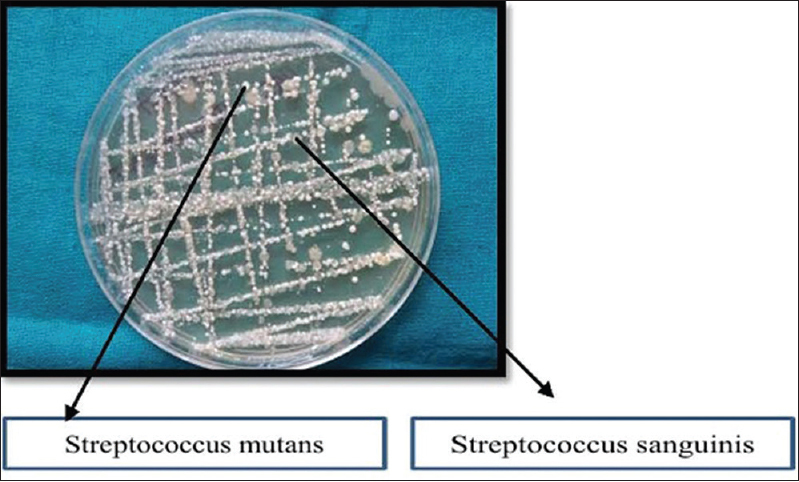 Streptococcal antagonism in oral biofilms: Streptococcus sanguinis and Streptococcus gordonii interference with Streptococcus mutans. J Bacteriol 2008;190:4632-40. Berkowitz RJ. Acquisition and transmission of Mutans streptococci. J Calif Dent Assoc 2003;31:135-8. Loesche WJ, Straffon LH. Longitudinal investigation of the role of Streptococcus mutans in human fissure decay. Infect Immun 1979;26:498-507. Caufield PW, Dasanayake AP, Li Y, Pan Y, Hsu J, Hardin JM, et al. Natural history of Streptococcus sanguinis in the oral cavity of infants: E: Evidence for a discrete window of infectivity. Infect Immun 2000;68:4018-23. Loesche WJ, Rowan J, Straffon LH, Loos PJ. Association of Streptococcus mutants with human dental decay. Infect Immun 1975;11:1252-60. Carlsson J, Grahnén H, Jonsson G, Wikner S. Establishment of Streptococcus sanguis in the mouths of infants. Arch Oral Biol 1970;15:1143-8. Loesche WJ, Eklund S, Earnest R, Burt B. Longitudinal investigation of bacteriology of human fissure decay: E: Epidemiological studies in molars shortly after eruption. Infect Immun 1984;46:765-72. Roshan NM, Shigli AL, Deshpande SD. 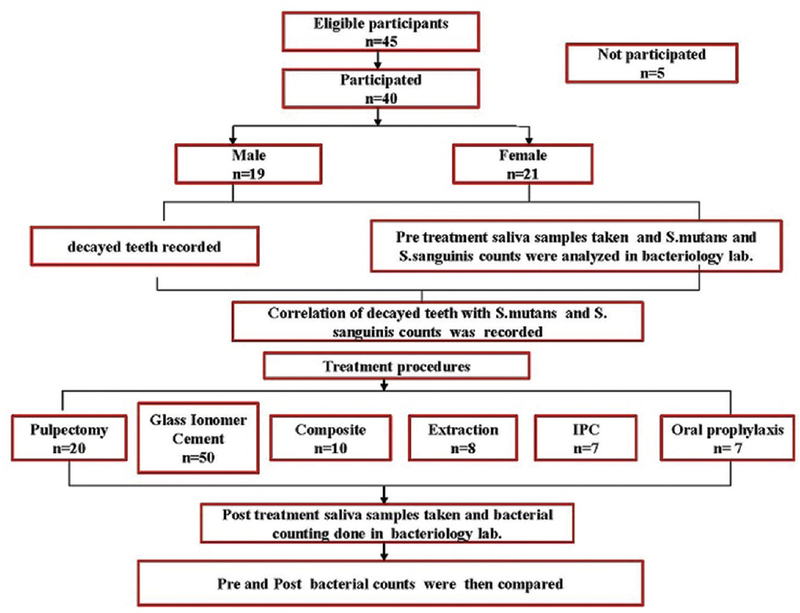 Microbiological evaluation of salivary Streptococcus mutans from children of age 5-7 years, pre- and post-atraumatic restorative treatment. Contemp Clin Dent 2010;1:94-7. Tanner AC, Kent RL Jr., Holgerson PL, Hughes CV, Loo CY, Kanasi E, et al. Microbiota of severe early childhood caries before and after therapy. J Dent Res 2011;90:1298-305. Becker MR, Paster BJ, Leys EJ, Moeschberger ML, Kenyon SG, Galvin JL, et al. Molecular analysis of bacterial species associated with childhood caries. J Clin Microbiol 2002;40:1001-9. Kreth J, Merritt J, Shi W, Qi F. Competition and coexistence between Streptococcus mutans and Streptococcus sanguinis in the dental biofilm. J Bacteriol 2005;187:7193-203.